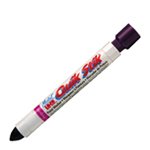 Solid permanent markers in 19 colors for permanent marks on rough surfaces include structural steel, wet surfaces. A complete slection of Valve Action liquid paint markers for rusty, oily and clean metal. Markal Vallve action are available in permanent, removable, certified low chloride and fluroescent. Temperature indicator markers including the Tempil and Temp Stik brands for measuring surface temperature from 125 deg F to 2000 deg F.
Specialty markers for temporary marks in galvanizing and high temperatures in foundries. Steel tip markers in pen and automated dispensing machines for high speed automated marking. Low Chloride for Stainless Steel and Nuclear applications. Pink and Brown In Stock! Marks at room temperature and withstands up to 1600 deg F. Withstands heat treating, oil and water baths. 200 PPM Total Chlorides and Halogens. Use On Stainless Steel Or Super Alloys. Solid Paint For Is Great On Any Surface. Comes in a convenient holder for field use. Bleeds through solvent-based paints. Save 10 percent on boxes of 12. Gives instant temperature readings up to 999 deg F. Ideal for welding and industrial temperature measurement. Works on any stationary solid surface! Automate your marking needs with this low cost, pressurized hand free marking system. Available in 2mm, 3mm and 6 mm tip size and up to 12 colors. Compare our prices to the Big Box distributors and save more than 50%! Available in 19 Colors. Tempil Markers Are Available Ranges From 125 Deg F to 1800 Deg F. We special order custom temperatures not on our site. Special Pricing Thru December 31st. Markal Fluorescent and UV Markers. Stock Just Arrived! Pocket Clip, Vibrant Colors.